Hi, my name is Mel, and I am a gadget-ophobe. Well, I guess that is not strictly true, I just don’t see the point of most of them. I suppose this comes partly from the make-do-and-mend attitude I have retained since my uni days, when all I had was a block of knives, a mixing bowl, a wooden spoon and a balloon whisk. Anything else I had to improvise with a wine bottle (useful as a blender and a rolling pin! ), or whatever else was to hand. Obviously, I have got many more of the basics now, which allows me to do much more, but I still have not been suckered by many of the more ‘faddish’ gadgets, such as a breadmaker, or ice cream machine. I enjoy making bread, and take great pleasure from trying to get a tight round, or a nice airy foccacia. I have never really attempted ice cream before now though, because I was under the impression it was difficult. It was also not easy to find a recipe that did not involve the instructions to “place all of the ingredients into an ice-cream machine”. Anyway, a bit of hunting around, and a lucky episode of Masterchef Australia left me a bit more encouraged try to make my own, especially since they recommend a custard base, and I do like a good custard. Because I wanted something to serve with rhubarb, I chose to flavour this one with ginger. Finely chop the ginger, and add that to the milk and the cream in a pan. heat to just below boiling point.Set aside to steep for 20 minutes. Pass the liquid through a sieve to remove the pieces of ginger, but set them aside though, because you will use some later. Bring the liquid back up to boiling point. In general, for flavoured custards, you add the flavouring to the milk – you also do this with the vanilla pod if you are making custard to go with your apple pie. So, if you want to make mint ice cream, and the essence to the milk, add cocoa or melted chocolate for chocolate ice cream and so on. In a separate bowl, beat the egg yolks and the sugar together until they thicken quite a bit. Now for the tricky bit (or so they tell you). Very slowly at first, add the warm milk to the egg mixture. I do this by adding a little, and making sure it is whisked in before I add more. Once you have combined a fair amount, you can add the rest of the liquid much faster. Once the egg and cream is combined, returned to the heat and heat gently. Do not allow it to boil, or it will curdle. The custard will thicken, and when it leaves a line on the back of your wooden spoon then it is thick enough. Remove from the heat. 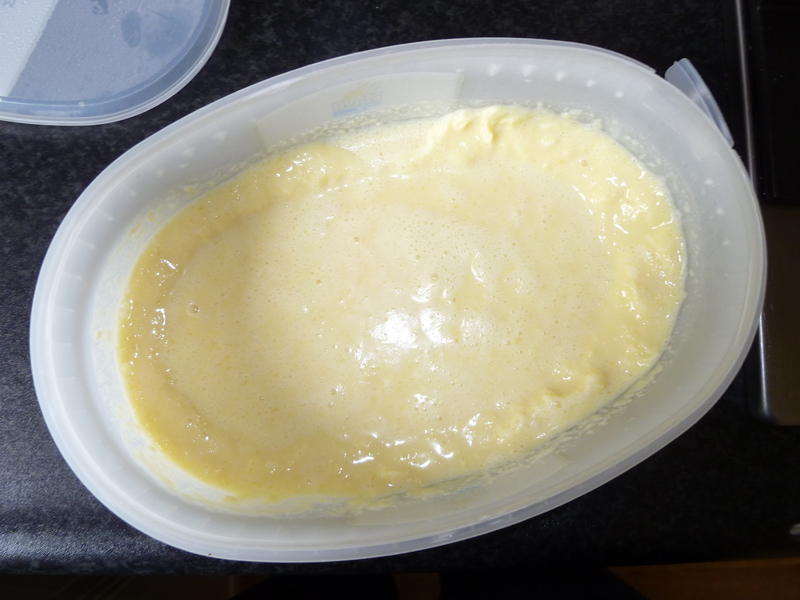 The custard needs to cool completely before you try to freeze it (not least for energy efficiency of the freezer!). You can either set it aside to cool, or a better way is to put it in a bowl, which is sitting in some ice in another bowl (or the sink) and stir it to dissipate the heat faster. 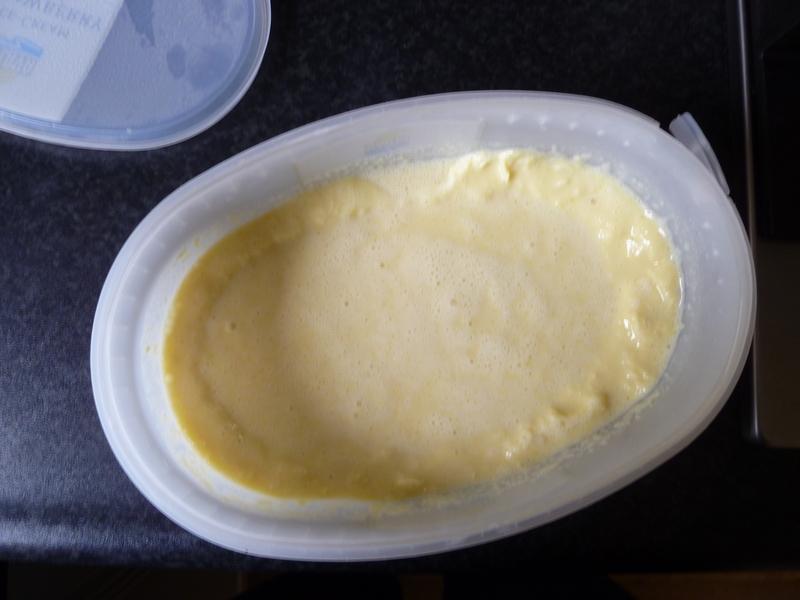 Once the custard is cold, then you need to put it in the freezer. Most sources I read said that you should put it in a bowl for this stage. 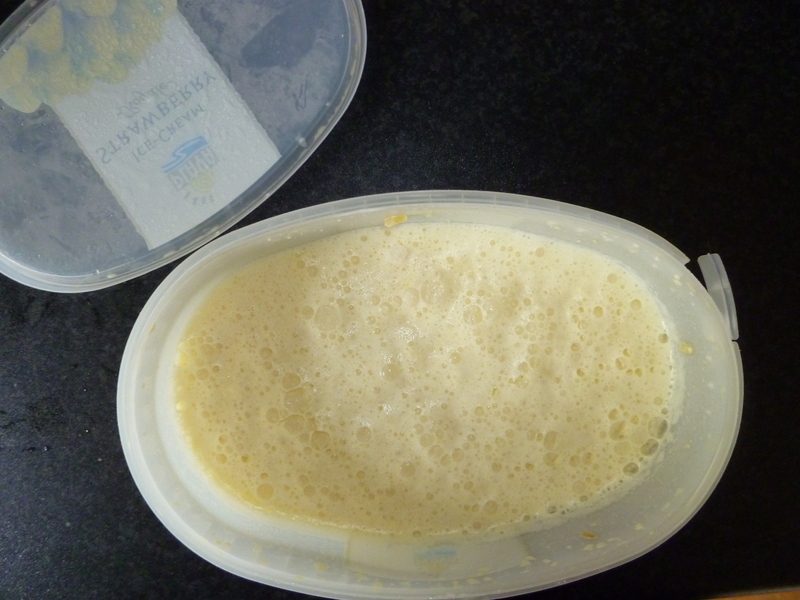 Unfortunately, I didn’t read that until after I had frozen it, so I put it in an ice cream tub (recycled, of course). As long as the custard does not fill more than 3/4 of the vessel, it will be fine. In order to make ice cream, er, creamy, you need to try to keep the ice crystals from getting too big. To do this, put it in the freezer for an hour, then take it out and whisk it. Repeat this process until you have a smooth, thick ice cream.For this recipe, I found it took four times to create the smoothness required. Because I like ginger, I stirred in some of the chopped ginger from the custard making at the last stage of the whisk and freeze cycle. You could also add anything that you like at this stage – nuts, mint chips, chocolate chips, fruit. The ice cream should last a few weeks in the freezer (in theory! ), just don’t forget to take it out of the freezer about 10-15 minutes before you want to serve it. 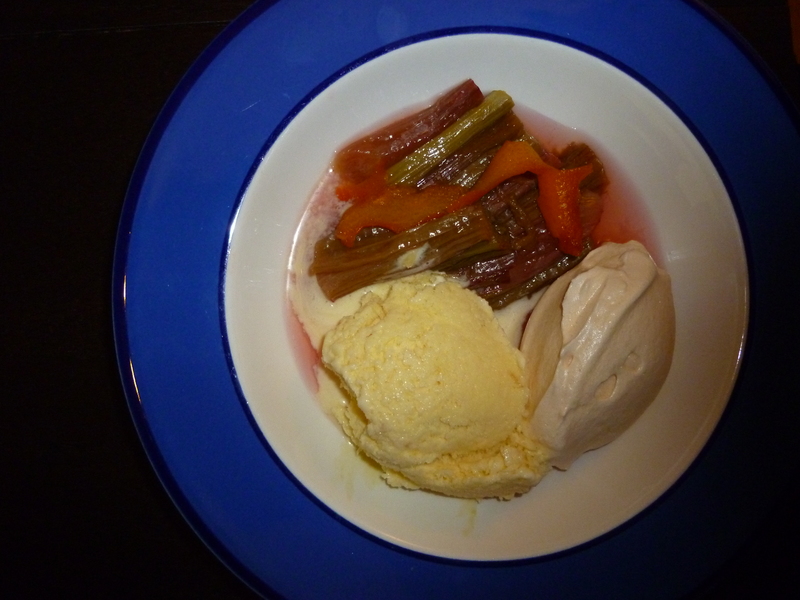 I served mine with the aforementioned poached rhubarb, and some meringue. Well, I needed to use up those egg whites somehow!